Note: If you want to use anything other than heavy cream in this recipe, please know that you will not get optimal results. All the fat in this recipe comes from the cream (instead of butter) so if you use low-fat milk or any other kind of dairy, the whole recipe would need to be tweaked. If you do not want to use cream, I would recommend making another biscuit recipe that you are familiar with and just adding cinnamon chips as directed below. Heat the oven to 425°F. Lightly grease an 8 x 8-inch baking pan, or line it with one sheet of parchment paper, hanging over the sides. In a large bowl, whisk together the flour, sugar, baking powder, and salt, breaking up any large clumps in the brown sugar. Pour in 1 1/4 to 1 1/2 cups of the cream — just enough to make a thick, fairly wet and sticky dough — and mix quickly, just until combined. Dump the dough out on a floured countertop and pat into a long, thick rectangle. The dough will be firm, yet wet and sticky. Slice the rectangle into 8 equally-sized squares. Lay half the squares in the prepared baking pan. Sprinkle about a tablespoon and a half of cinnamon chips over each square. 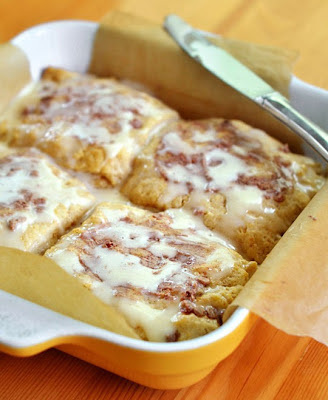 Cover the cinnamon chips with a second square of biscuit dough and lightly press the edges to seal. Repeat with each biscuit. Top the biscuits with the remaining cinnamon chips. Bake for 14 to 16 minutes, or until the biscuits are barely golden on the outside and just cooked through. Remove from the oven and use a knife to spread and smear the now hot cinnamon chips on top of the biscuits. Whisk together the remaining 1/2 cup cream, confectioner's sugar, and vanilla. Lightly drizzle the biscuits with this glaze (you may not want to use all of the glaze). Serve and eat while hot.